Located directly below the constellation Orion is Lepus the Hare. Its brighter stars shine between magnitudes 2.5 and 3.7. Lepus takes up only 290 square degrees of sky ranking it 51st in overall area. The brightest star of the asterism is named Arneb, an F class supergiant star located 2,200 light years away. The massive star measures 75 solar masses and 36,000 times brighter than our Sun. If it took the place of our Sun, Arneb would extend to about the orbit of Mercury. The only Messier object to reside within the constellation’s boundaries is M79. Other than the fact, this cluster lies some 40,000 light years from us; it resides opposite from the center of our Milky Way Galaxy. Globular clusters tend to live around a the galaxy’s nucleus like flies around a street light. By measuring its distance, astronomers calculate M79 is about 120 light years wide. This magnitude 7.7 target can be located with simple binoculars by drawing an imaginary line from the star Arneb and through Nihal. Halfway between Arneb and Rigel and bit east we see the Spirograph Nebula. Catalogued as IC 418 it is estimated to be about 2,000 light years away. Only through the perfect eyes of the Hubble does the inner structure of this planetary nebula reveal itself. The finely woven nebula measures 0.2 light years across and is the result of the red giant’s layers being ejected into space. This is the same fate awaiting our Sun five billion years from now. If you are up to a bit of a challenge, I suggest the pair of NGC 1738 and 1739. These two seem to be overlapping together but lie 170 million light years and 180 million light years respectively. NGC 1738 is the brighter of the two at 13.7 magnitude while NGC 1739 is a magnitude fainter. One of the brightest galaxies residing in Lepus is NGC 1964. This magnitude 10.8 spiral measures about one fifth of the full moon’s width. 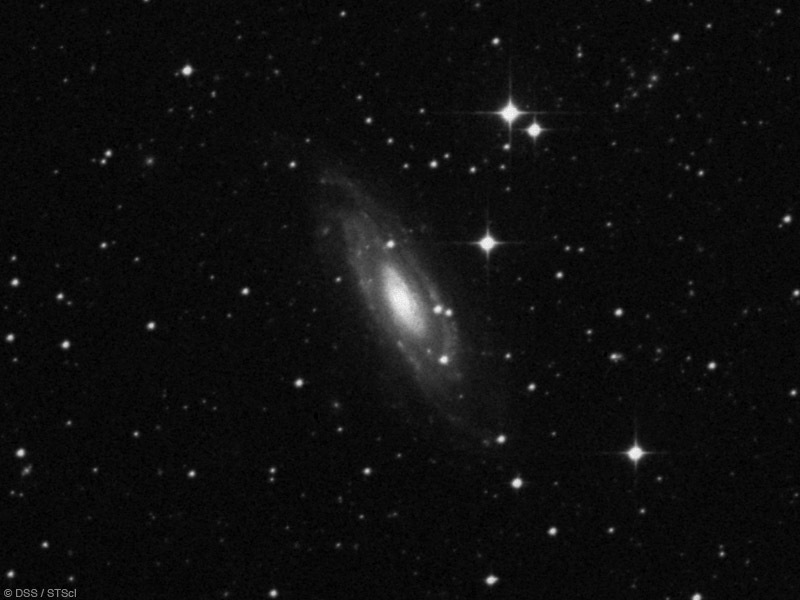 It has a delicate spiral arm structure and is a great target for astrophotography. To find NGC 1964, relocate the star Nihal and move almost one and a half degrees southeast. For the first two week of February look for the ghostly zodiacal light in western skies after twilight. It is a slanted wedge of light found along the ecliptic and is caused by the reflection of sunlight off dust particles along the plane of the solar system. To witness and image this display, head to the dark countryside far from any light source. The zodiacal light actually point to the Pleiades but does not reach. This should be a great guide. Jupiter is the brightest of the morning planets with fainter Mars to the lower left. Follow the red planet as it moves away from Jupiter but do not confuse with the reddish star Antares. Mars moves to the north of the star. Saturn is now emerging out of the solar glare and forms a wonderful equal distance line-up with Mars and Jupiter on the 20th. There will be a partial solar eclipse on February 15 over most of Antarctica and the southern tip of Africa. This come two week after the total lunar eclipse seen in its full extend on the west coast. The next total lunar eclipse over Canada occurs January 21, 2019. New moon (lunation 1177) occurs on 15. There is no full moon for February but the Snow Blinding Moon will occur on March 1.